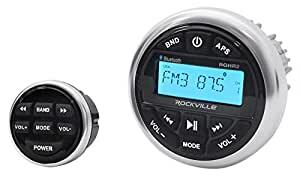 Included in the box: Marine digital media receiver Wired remote with 32.8 foot wire USB extension cable (40 inches) Mounting bracket Screws ISO wiring Owner manual and warranty The Rockville RGHR2 is the best gauge hole receiver on the market. We developed this to give you the best sound and the best features. Crazy loud! We put in a built in amplifier that is louder than other marine receivers on the market. The RMS power of the built in amp is 28 watt x 4 channels! It is crazy loud and can be heard over the sound of the wind when you are on the water! There is also a built in EQ to customize the sound to your taste. Included wired remote Rockville is the only brand on the market that I know of that supplies a wired remote with your radio. The wired remote is a must have for any marine radio. This is great for boats and other powersport applications. We also include an extra long 32.8 foot wire so you will not need any additional extension cables. Latest listening features The RGHR2 gives you many listening options. The Bluetooth technology allows you to stream audio from your Bluetooth enabled phone or other music player to the receiver. Our Bluetooth distance is 50 feet! There is also a USB input allowing you to listen to music stored on a thumb drive. You can plug in any audio device to the auxiliary input. There is a built in radio with crystal clear reception as well. Ability to connect multiple external amps This receiver makes your system expandable. Two sets of pre-amp outputs allow you to hook up external amps for your speakers and/or subs. This has front and switchable rear/sub pre-amp outputs so you can amplify your speakers and a subwoofer amplifier.